Britannia Dermedics offers double-chin treatment. 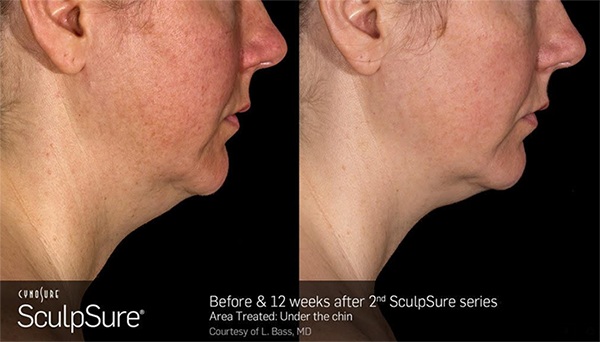 SculpSure Submental is an advanced non-surgical, non-invasive body contouring technology that can help correct the appearance of submental fullness beneath the chin. Are you concerned that a “double chin” is causing you to appear older or heavier than you may be? Many people across the country experience submental fullness beneath the chin, often referred to as a “double chin”. Britannia Dermedics now offers SculpSure? for submental fat reduction to help redefine your facial contours for a youthful, healthier appeal. SculpSure Submental is an advanced non-surgical, non-invasive body contouring technology that can help correct the appearance of submental fullness beneath the chin. Approved by Health Canada, SculpSure? Submental is an effective and safe way to help redefine the outlines of your facial profile.